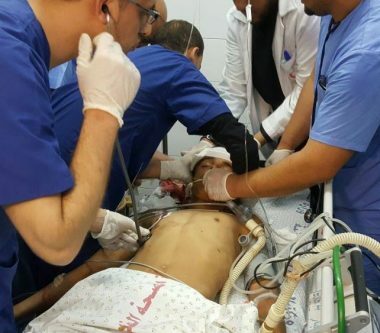 The Ministry said the patients who have scheduled surgeries were official informed of postponing their medical procedures due to the large number of Palestinians, injured by Israeli army fire. The head of the General Administration of Gaza hospitals, Abdul-Latif al-Haj, said the wounded Palestinians, and due to the varying nature of their injuries, consume more medical supplies than ordinary patients, especially sterilized bandages, stitches, and surgery tools, in addition to various sorts of antibiotics, IV solutions, and anti-coagulants. He said that the number of external bone fixation devices used on patients who suffered gunshot wounds, since March 30th, is more than the average amount for an entire year. It is worth mentioning that the army have killed 39 Palestinians, and shot more than 25000 others, since the nonviolent protests started in the Gaza Strip on Palestinian Land Day, March 30 2018.